Last Updated: Sunday, 6 p.m.
Aug. 10–Carl Laundrie woke up around 9 this morning, with family at his side, and has been conscious, conversant and able to eat, his son, Carl Laundrie III, said this afternoon. The younger Luandrie, who is 35, is himself a firefighter-paramedic with Volusia County. Laundrie also has a 40-year-old daughter and a 34-year-old daughter, one of whom lives in Boston, where Laundrie’s wife Wanda was visiting when she got the call about the accident. Wanda was able to be by her husband’s side by 1 a.m. this morning. Carl and Wanda have six grandchildren, and will soon have a seventh. Doctors have ruled out a stroke or a cardiac event, but have not yet determined the cause of issue that led to the accident, which Laundrie does remember. “For the most part he hasn’t really talked much about the accident but he remembers everything,” his son said. Laundrie is “in real good spirits,” his son said, and has been making progress enough that he may be transferred out of the Intensive Care Unit and into a regular room soon, and may even be discharged by Monday. “It’s a good possibility, as long as his progress continues the way it is now, it wouldn’t surprise me at all,” the younger Carl said. Laundrie was visited by one of the firefighters who rescued him, and has received other visits, including that of Commissioner Barbara Revels and Joe Mayer, the director of facilities, though ICU visitations are severely limited. 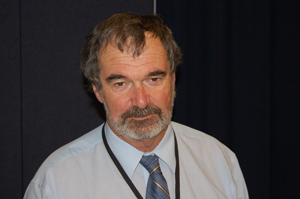 Saturday afternoon, Craig Coffey, the county administrator, updated county commissioners of Laundrie’s condition in a brief email, after he spoke with Wanda Laundrie. Aug. 9–Carl Laundrie, the long-time public information officer for Flagler County government, was in critical condition Friday afternoon after he drove an SUV into the retention pond on the east side of Flagler County’s Emergency Operations Center Friday afternoon. A Florida Highway Patrol investigator said Laundrie was in critical but stable condition. He was later said to be improving. The wreck took place at 1:23 p.m. as Laundrie, 65, was taking the curving road around the EOC, a road he’s taken countless number of times on his way to his office at the Government Services Building. He was driving a blue, 2012 Ford Escape. 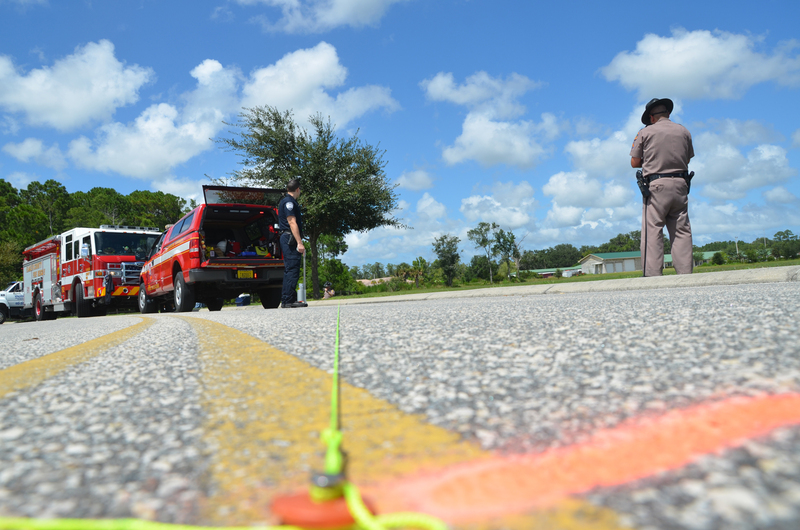 He was transported to Florida Hospital Flagler, where he remains, under sedation as of 3 p.m., as physicians attempt to determine what caused the wreck. Laundrie had brain surgery two years ago. 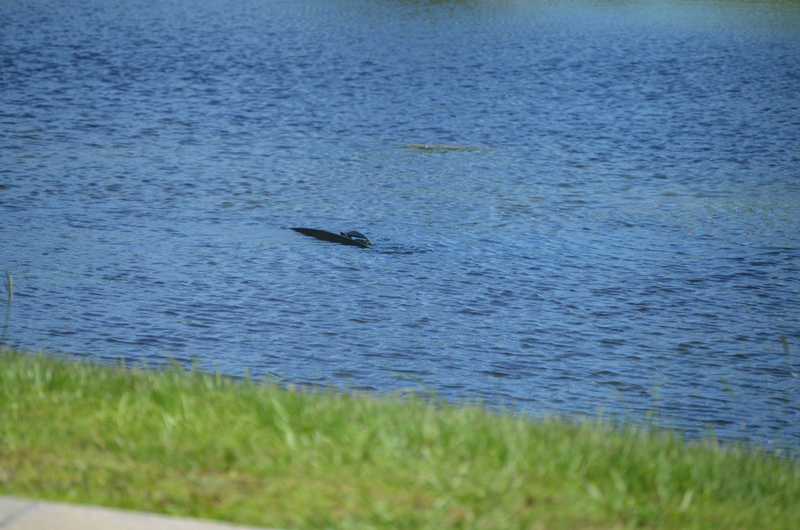 He was saved by an employee at the EOC and firefighters who happened to be training within sight of the pond. 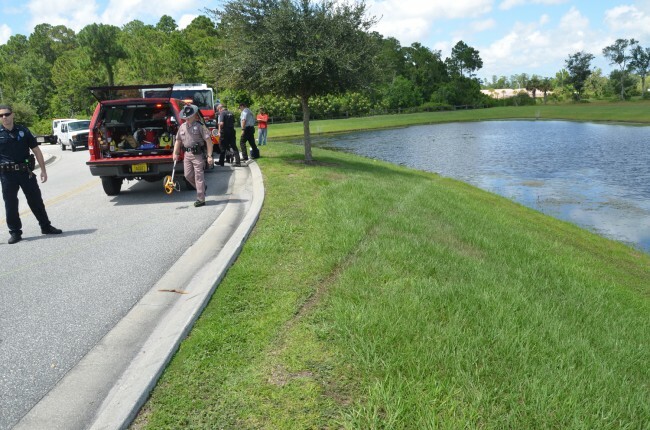 The men who dove into the pond and saved Laundrie are Rolf Preuss, the 911 coordinator at EOC (an employee of Emergency Services under the county’s aegis) and Flagler County Fire Rescue Lt. Andrew Keppler and firefighter Sean Walker, along with Rob Gavazzi, the county’s HVAC technician. The firefighters were at the docking station of the EOC, training on a new, 2013 fire truck that went into service only Sunday, when the wreck took place. 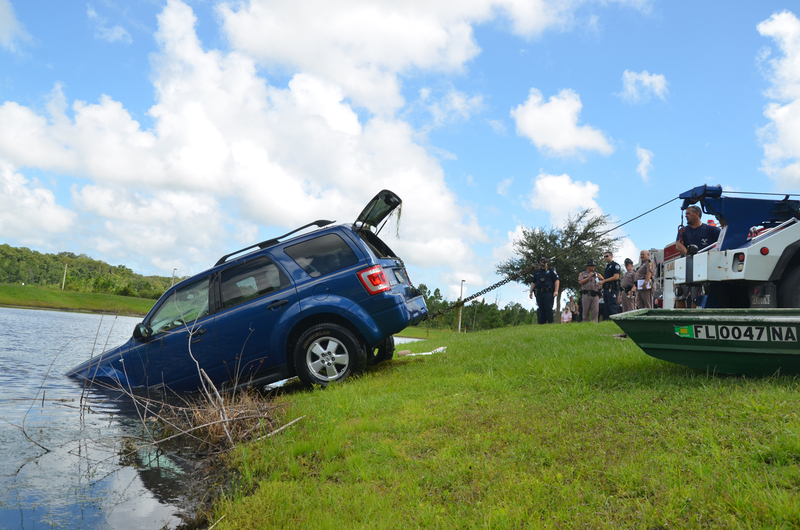 They made sure, while they were under water, to feel their way through the SUV, certifying that there were no other individuals there. The vehicle was entirely immersed when the rescuers went after Laundrie. 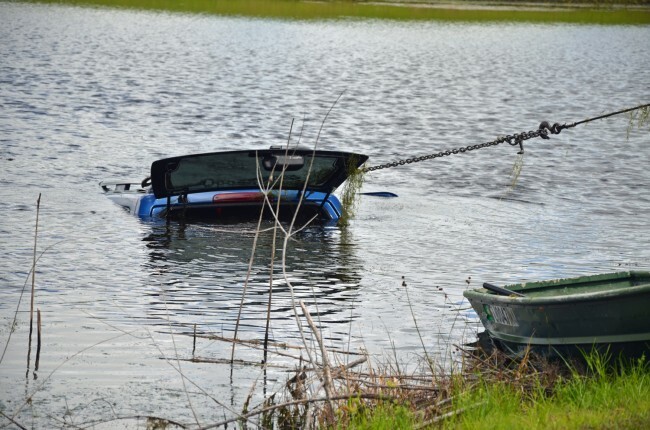 Had the wreck taken place without witnesses present, it’s unlikely that Laundrie or his vehicle would have been immediately discovered: barely a tiny segment of plastic from the rack on the roof of the vehicle was visible above the water, and would be easily missed by anyone not knowing what was beneath. At one point Flagler County Sheriff’s divers were getting prepared to dive in to fish out personal effects such as wallets and keys dropped there by the rescuing individuals, but for safety reasons the office eventually ruled against it. 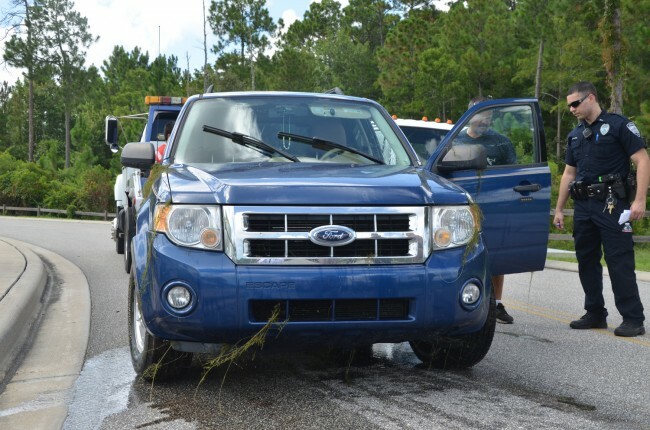 Florida Highway Patrol investigators took over the scene, with assistance from the Bunnell Police Department and the Flagler County Sheriff’s Office. Investigators were at the scene for almost two hours before a crew from Roger’s Towing began fishing out the vehicle. Flagler County Administrator Craig Coffey was off Thursday and Friday, and was shaken by the news even as he kept getting updates from the hospital, where Laundrie’s son was. Only a few days ago Laundrie was spending some time off in the Keys, enjoying lobster season and managing to catch some 20 lobsters, Coffey said. Laundrie is planning to retire in two or three years, but “he was going to hang with us for a few more years,” Coffey said. Laundrie has been Flagler County’s communications director since early 2003, when he ended his career as a reporter for the Daytona Beach News-Journal and, for several years, as the Flagler editor of the Flagler News-Tribune. One of his very last by-lined story for the paper ran on Oct. 25, 2003. It was about a wreck. But it involved a Cessna plane, two young pilots and a turkey buzzard. 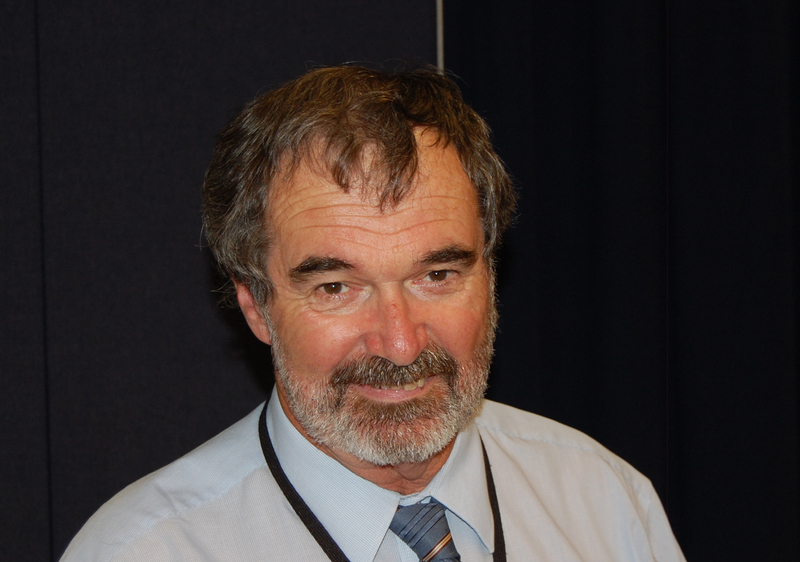 Four days later, Laundrie wrote his farewell column. “After 25 years of reporting on Flagler County ‘s successes and its tragedies, both large and small, I am joining the county staff to help them write about this beautiful place in which we live,” he wrote, crediting the late Josephine Davidson, wife of then-News-Journal publisher Tippen Davidson, for steering him in the right writerly direction. He could at times see into the future. I have known Mr. Laundrie for nearly all of my life. My thoughts and prayers are with him and his family during this difficult time. My thoughts are with Carl, I’m so very sorry to hear about this. Wishing Carl the best to pull through without any lasting ill effects. Our prayers are with Wanda and family. Prayers for Carl for a fast recovery. God was with you, my friend. And Thanks to all those that rescued Carl. So sorry to hear about this! My thoughts and prayers are with Carl and his family, for strength and a quick recovery. We are praying and hoping the best for Carl. My prayers are with Carl and his family. Thoughts and prayers for Mr. Laundrie and his family. Many thanks to Mr. Preuss, Lt. Keppler, and Mr. Walker. Hoping for a speedy and Full Recovery for you! Mr. Laundrie. Thank God some firefighters and an employee were right there because, without them, Mr. Laundrie would not be alive right now. Hope he makes a good recovery. Wow, what can you say? Another case where life can change so suddenly. I pray Carl has a speedy and full recovery. Wish you a speedy recovery and thoughts and prayers go out to you and Wanda. Your a tuff old bird so no doubt you will pull through this with flying colors! Sending Carl my prayers for a full and speedy recovery…..
box car hope pops is ok!!! Knowing Carl, he’ll give the fight his all. Our best wishes for a speedy recovery for our Navy vet. 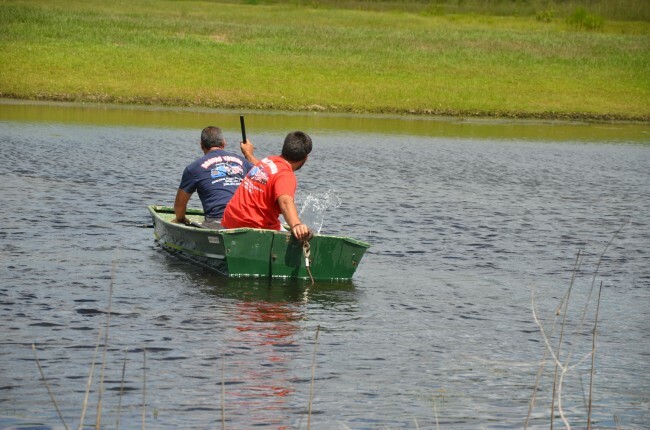 Flagler County Horseshoe Pitching Club,wish you a speedy recovery.Our prayers go out to you. How about a heroes applaud and recognition for Mr. Preuss, Lt. Keppler and Firefighter Walker. You gentlemen single handled saved this mans life. God Bless you for efforts and response. A stronger applaud for Mr. Preuss who is a civilian employee. Well job sir! You are a fine citizen and if there were ever a Citizen of the year you are it! Lt. Keppler and Firefighters Walker and Gavazzi – well done gentlemen! I am proud of you! To the family of Mr. Laundrie. I do not know him, but he is in my thoughts and prayers over the next few days. Hey! Sean is my son and I know Andy as well. How about some recognition for guys going above and beyond. They were not on station duy. This wasn’t their 1st rodeo. They have saved many. Honored to call carl, wanda and the whole family friends. We are sending lots of prayers for your recovery, carl. You are so missed in the old neighborhood; so many laughs! :). Things are bound to get better. You’ve got wanda at your side. Truth: Carl Launderie is one of the greatest guys I have ever known. <3 Get well soon! So saddened and shocked to hear this awful news. Sending healing wishes to Carl and support to all who know and love him. Wishing a speedy recovery. Once again our hero’s from Flagler County come to the rescue. Well done gentlemen. You are Carl’s angels. We have known Carl since the 70’S, hang in their Carl, there are many more stories for you to write. carl is like mr. flagler county to me…known for more years than I can remember. he has served us in this community in one way or another for many years to remember. hope all is well and he is strong to the core. The poor guy. He seems like a good guy to have a beer with. Wishing Carl Laundrie a speedy recovery, and better days ahead. Carl is such a sweet, gentle man as well as a gentleman. I wish you a speedy recovery, and all the joy of retirement your hard work earned. Good job to his rescuers and you hang in there, Wanda. I wrote prayers & best wishes earlier in this post ,now after thinking about for a little while,I’m thinking ,WHY no guard rails or chain link fences are around all these man made ponds we dig for ground fill for the property or for water run off retention,this is not the 1st time this kind of accident has happened ,actually there have been quite a few of these situations ,the county is so strict on building permits to build ,let’s say a shed on property.why not a rule that guard rails or chain link fencing be installed around. These man made water properties,look at county road 302 for instance. That deep canal that was dug all along the last few miles of CR 302 a vehicle could easily run off the edge of that roadway ,NO GUARD RAIL ??? But yet they have money allocated to plant trees along belle terre pkwy,isn’t a life worth saving more so than ornamental planting of trees ??? Thank god someone saw mr. Carl drive off the road and saved him ,may not be so lucky for some poor soul that nobody see’s some day drop off that dangerous stretch of roadway near the mondex,think about this county commissioners, dumb spending issues elsewhere is more important than a human life ?? ?i don’t think so!!!!! Again best wishes for Carl’s speedy recovery..
Carl, saddened to hear about this, but happy to hear you are on the mend…here’s to your continued strength and best health! 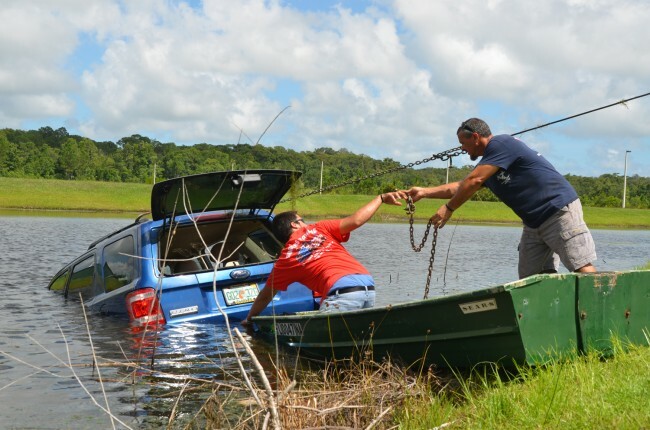 Not sure if anyone really knows this but Nicholas Fey actually pulled him out of the sinking car and saved his life. Emergency guys showed up after he already got the door open and the man almost out of the car. He is a hero for doing what he did! Carl’s life was in jeopardy and Nick just acted :) Carl is very lucky to have had Nick and Patti Fey passing by at that exact point :):) We need more people like Nick!! So glad Carl is doing better!!! Our Dad has read every one of these comments posted. He appreciates the well-wishes, prayers, and support. 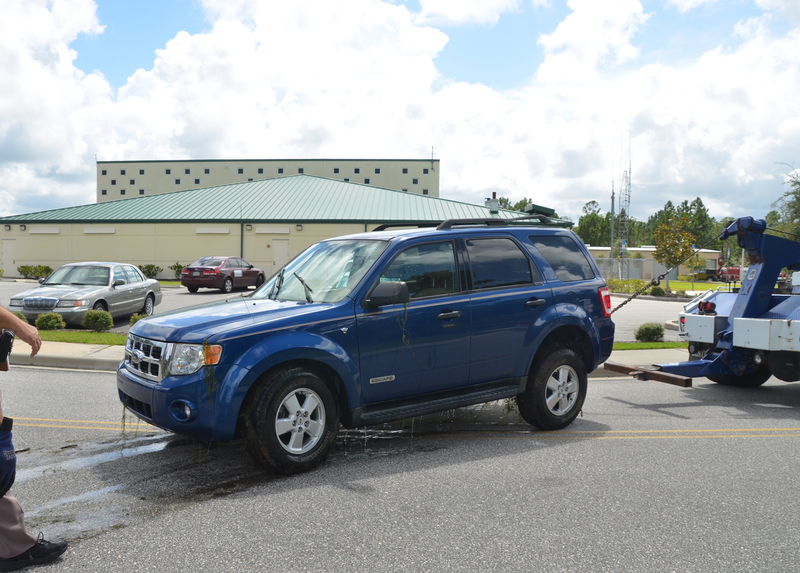 It shows that Flagler County is a great place with caring people in which we are lucky to call our home. Our family is in debt to those that rescued our Dad and we cannot thank them enough. Our son, Carl, let us know what had happened as we are traveling. What a shock! We wish you a speedy recovery and you are in our thoughts and prayers. Why no mention of the person that pulled him out of the car?